Foldable speakers - whatever next? NXT, the Cambridgeshire-based electronics specialist who pioneered flat panel speaker technology in the 1990s, has announced details of its latest loudspeakers – two foldable, portable models manufactured by mobile accessories specialist Targus. Although the speakers are aimed squarely at music on the move, following the launch at MacWorld 2008 earlier in the year, NXT has its roots in performance-based audio. The Traveler’s Choice compact stereo speakers comprise a set of sleek, ultra-thin NXT portable speakers using the company’s proprietary Balanced Radiator (BR) technology, making them handy for traveling music lovers as well as laptop users. 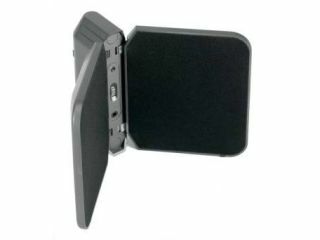 Designed for use while ‘on the road’, the Traveler’s Choice speakers can be attached to laptop computers via USB, or to the supplied battery pack, which is powered by four AAA batteries. Audio input is via a standard 3.5mm jack, ensuring the speakers are compatible with portable music players, laptop computers and a number of other media sources. The Traveler’s Choice speakers clip together magnetically when not in use and are available in a choice of black or red finishes. They will be available nationwide in the early summer.